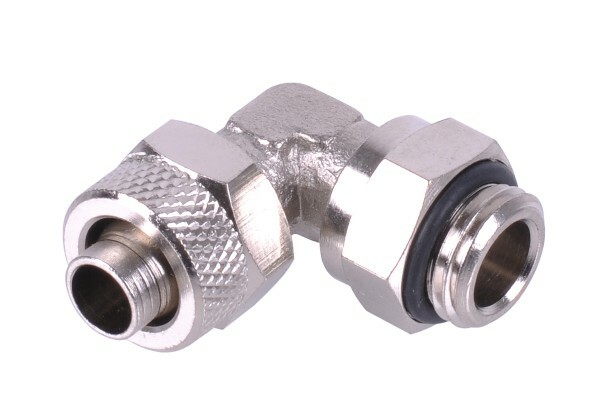 High quality angled (elbow) screw-on fitting with cylindrical threads (G1/4) for 10/8mm tubing. The fitting is angled by 90° and can be rotated freely (360°). Ideal for Chipset- or graphics card cooling as well as self-constructions where angled fittings have advantages. The hose is fixated and sealed tightly by the union nut, yet it can be released easily with one hand. This system ensures maximum safety and ease of installation. Extent of delivery: Screw-on fitting with O-Ring and union nut. Could you please measure the height of this item? Specifically the height from the nut at the G1/4 end and towards the angle. I want to see if it fits between two graphic cards.